What gets in the way of self-care? For me, there are lots of answers. Perhaps the most common stumbling block is that I forget self-care is as important as keeping my commitments—being a good parent, a good friend, a good partner, a good daughter—or as vital as what I create, what I do for my spiritual work, or even my relationship with the Earth. I put self-care at the bottom of the list and wonder why I run out of energy to do all those other really important things. Self-care is talked about often and is a topic that usually makes my eyes glaze over. Do you have the same reaction? I tell myself that self-care is trite or even one of those pet concepts that is a luxury of privilege. I am an expert at excusing away anything to do with self-care. I have a suspicion that the reason I conveniently “forget” to practice self-care actually goes much deeper. I’m pretty sure it has something to do with self-esteem and self-worth. Following the intention to practice self-care leads me to much more uncomfortable terrain than simply remembering that care of self helps me care more for everything else. I quickly want to jump ahead to my self-worth being based on what I can do for others. I need to justify my existence. I bet there is some good work for me to do here. 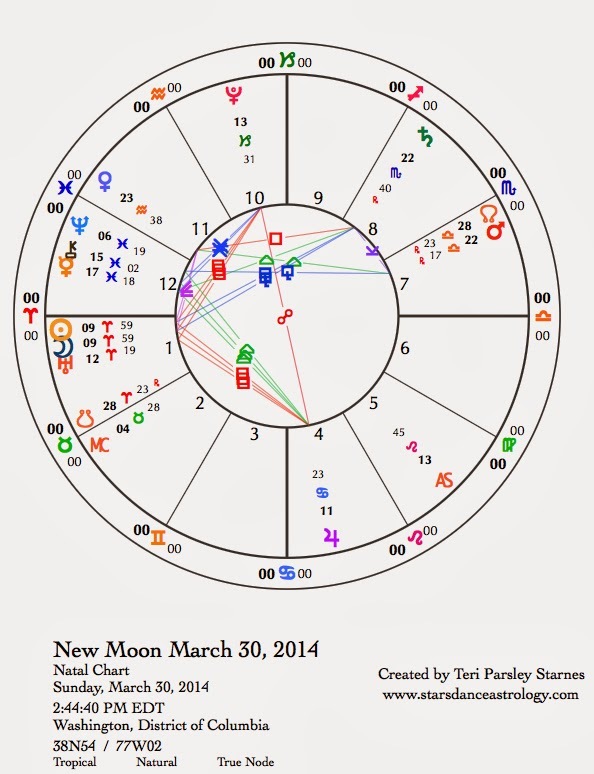 Last week, at the New Moon in Pisces,* I set an intention of self-care for this lunar cycle. This theme fits with this time of year. In many traditional cultures this season—late winter to early spring—is set aside for cleansing diets and lifestyles. The practice of fasting during Lent may have roots in the seasonal wisdom of preparing ourselves to emerge from winter’s dormancy into new growth. As the mutable sign that leads us into spring, Pisces offers wisdom about how to do this preparation. Pisces evokes themes of love, empathy, compassion, and a longing to shed the armors of defensiveness and isolation. Images of ocean paint Piscean realities where we dissolve the boundary between self and other. Self-care becomes feeds a larger purpose. It works the other way as well: The more I listen to the cries of others, the more I hear my own. Turning to self-love, we turn to Love itself. May this ocean cleanse us as we move through the final shadows of winter. Sunday, March 2. We are in the midst of four planets stationing right now (slowing down to change direction). As a consequence things could feel stuck for a few more days. (See the introduction to last week’s forecast: http://tinyurl.com/kcakdq7 to learn more.) Saturn stations retrograde today. When a planet stations the energy of that planet is more intense. A more intense Saturn can feel like a lot of pressure to do better; we can get mired in self-criticism or to take on too much work. This is a perfect opportunity to practice both self-love and self-care. Saturn isn’t called the Great Teacher for nothing. These pressures are invitations to surrender perfectionism to the great ocean of being. In Scorpio, Saturn encourages us to develop soul wisdom. With the Moon in Aries self-care takes the form of standing up for ourselves. We don’t have to go so far as to fight about it, but we might anyway. If anger shows up, it is also a teacher. Venus in Capricorn squares newly-retrograde Mars in Libra today. The tension of the day may take place in our primary relationships. Where does balance between self and other reside? Monday, March 3. What does self-care look like when you notice that others are not practicing self-care themselves? It is easy to get caught up in the herd mentality of doing more, doing it faster, and feeling like we are competing for the carrot being dangled in front of our eyes. What a good day this is to step back and breathe. The Moon in feisty Aries may trigger the ongoing t-square aspect pattern between Jupiter, Uranus, and Pluto today. The favorable sextile between the Sun and Pluto gives us extra power to make better choices for ourselves. Draw upon the reserves of vitality that become available when we do one good thing for ourselves. The Sun joins the shamanic healer, Chiron, this evening (CST). If your tendency is to offer healing to others before yourself, reverse that pattern. What happens? March 4—Crescent Moon: Beginning. The Crescent Moon is meant to infuse our intentions with optimistic faith. The morning’s energy (CST) may reverberate with a bit of the jagged energy of yesterday but settles into a nice groove when the Moon enters Taurus. The relationship between Taurus and Pisces is very supportive, offering the embodied wisdom of the Bull to complement the oceanic feelings of the Fish. Although the Moon will move out of Taurus by Thursday, we can create an anchor to this supportive energy today. The anchor can be an actual physical sensation or place in the body that reminds you of your intention and the possibility of changing old patterns. If you are also practicing self-care this lunar cycle, it is really important to notice what feels grounded and good to you today. Rather than put off doing that for yourself, make it the top priority. Wednesday, March 5. As I am writing the forecast for the week, I am already uncomfortable with the advice I am giving. I’ll reveal a not-so-secret secret; I write this forecast for myself, and I am getting a little nervous about this self-care intention for this lunar cycle. The challenge of today is to follow the body’s desires into wisdom. Notice which activities enhance vitality and which only bring numbing. This isn’t about perfection. I’m pretty sure I won’t be as mindful in this intention as I’d like to be. Yet, it is all information. Taking only one step towards vitality is a huge act of self-love. Venus moves out of Capricorn today where the planet of love has spent an extra-long period of time. Perhaps we learned more about our expectations in relationship, made some big commitments, or used personal charm to move toward our goals. Now, Venus in Aquarius gets very excited about diversity, freedom, and innovation in relationship. Support for our intentions will come from surprising places. Get ready to shake it up. Thursday, March 6. Early this morning before most of us wake up in the central time zone, Jupiter stations direct in Cancer. Perhaps a dream is sending you a message. 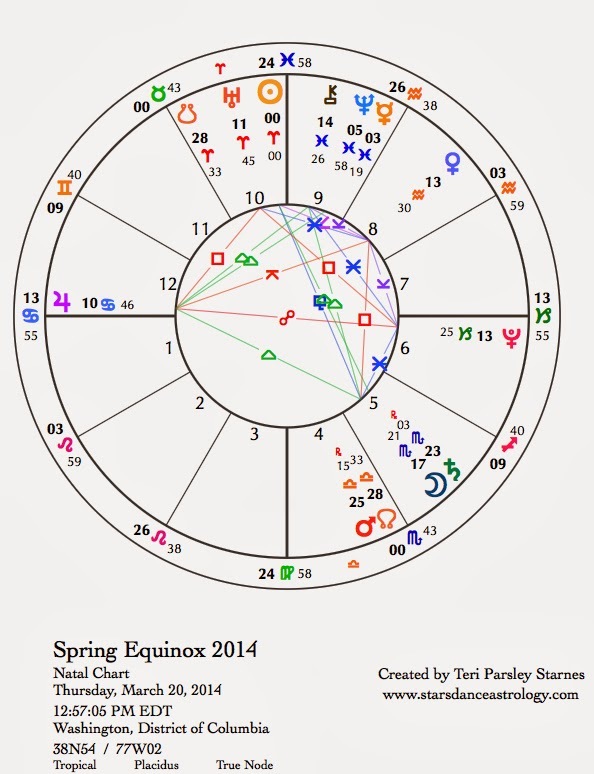 Since early November 2013, Jupiter’s movement through home-centric Cancer has been drawing us inward. The importance of emotional security may have influenced you more than you realized during this time. Now, like a wind-up toy that has finally been let go, the energy of these feelings is released into the changing world. Indeed the world is changing and it is critically important to know the role that emotional security plays in our choices. That way we can act more from choice than defensiveness. As I practice self-care this lunar cycle, I want to honor the central importance of hearth, home, and family to my wellbeing. Sociability increases as the Moon enters Gemini tonight. Friday, March 7. Now would be a good time to remember your anchor to embodied wisdom in support of intention for this lunar cycle (see the forecast for March 4). The Moon in airy, mutable Gemini may distract us enough that we conveniently forget what that intention was. I am choosing to follow a month of self-care based in self-love. Not a very easy intention for me. Distractions are welcomed. What reminds you to come back to yourself? March 8—First Quarter Moon: Manifesting. Astrologer Dane Rudhyar described this phase of the Moon as a “Crisis in Action.” Crisis may be too strong a word, but it does confer the idea that we reach a turning point at this phase of the Moon—the first real turning point of the lunar cycle that began on March 1. At this turning point we need to adjust to new influences, whether they are simply distractions or real challenges to our intention. 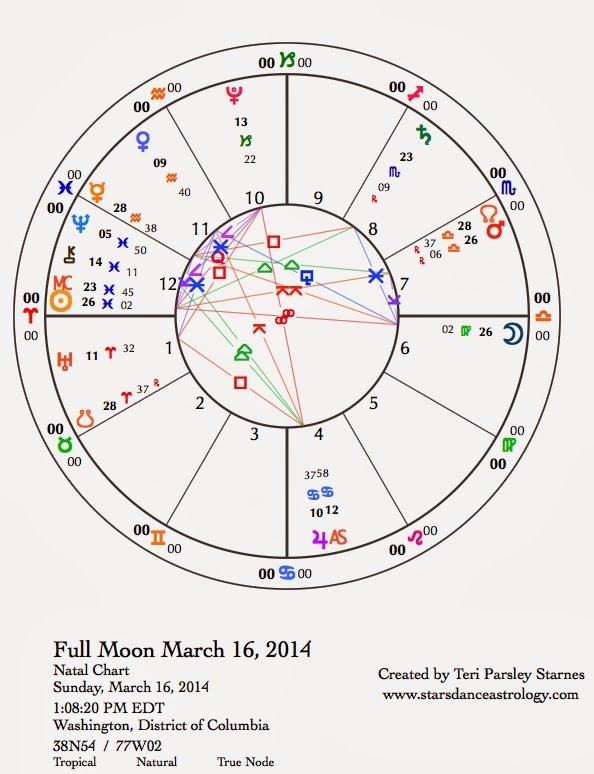 We might be tested in this phase to see if we really want to keep the intention of this lunar cycle. Do you? There is no shame in deciding the intention isn’t for you at this time. In fact, that is a valid choice. However, if you want to give up and at the same time, don’t want to give up, then what allies will help you stay the course? What new actions do you need to take? The Moon in Gemini suggests the challenges and perhaps the answers as well to this crisis. One challenge is a struggle to focus. One answer may be to open to learning a new practice that will inspire us to continue on. This is a mentally and socially active day. How does this energy support self-care? How does it detract?